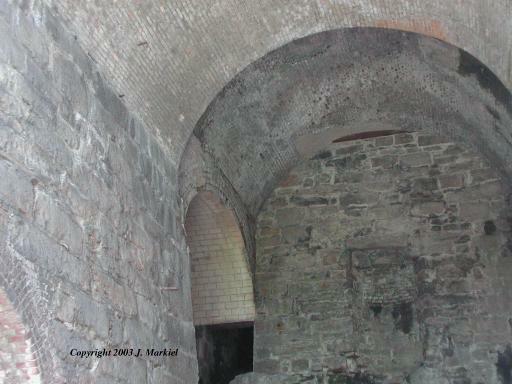 Scranton Furnace is perhaps one of the largest pre-1900 blast furnaces in the world. It represents the transition from the small furnace operation to a major industrial undertaking. 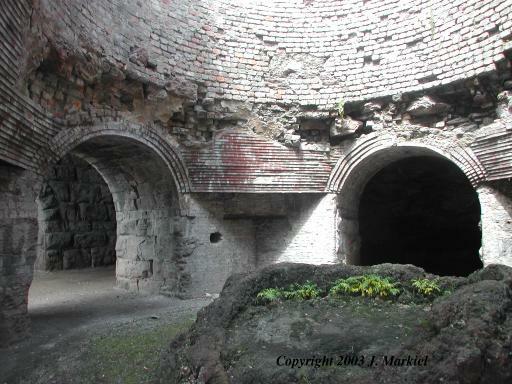 The original site contained five furnaces, of which four remain standing. 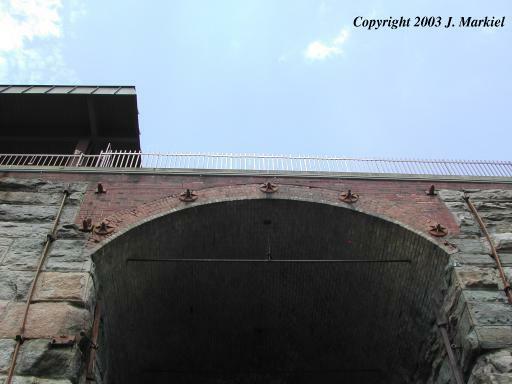 The Scranton Iron Works was integral to the development of Scranton as a town, to the development of the industrial age in the United States, and to the dawn of American industrial might. Yet this development came at a bitter price - the age of feudal like iron plantations was a thing of the past. The close relationship between the iron master and his workforce was replaced by a cold relationship based strictly on wages and output. The transition to modern manufacturing was accomplished without regard for the environment, the labor force, or the community. The history of Scranton is a fascinating microcosm of the nascent industrial age, with its glory and its skeletons. 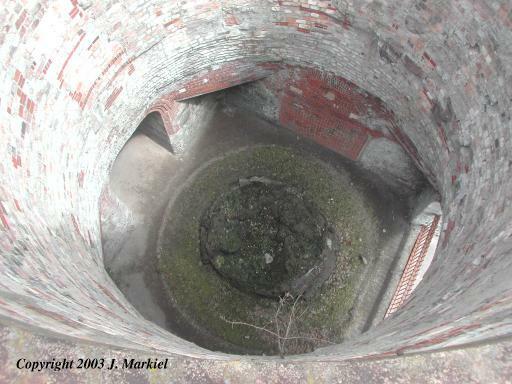 Most furnaces in the early colonial era utilized charcoal as fuel. By the mid 1800's, a number of individuals in both the United States and Britain were experimenting with anthracite coal as an alternative fuel. The devastation of the hardwood forests were an obvious problem to the iron masters, and the process of converting trees to charcoal was expensive. 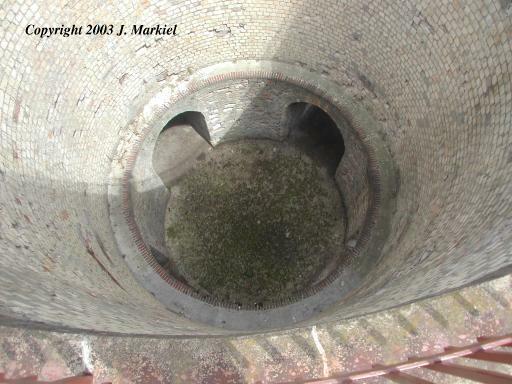 However, the technical problems associated with the use of anthracite coal were numerous, preventing many furnace owners from making the conversion. 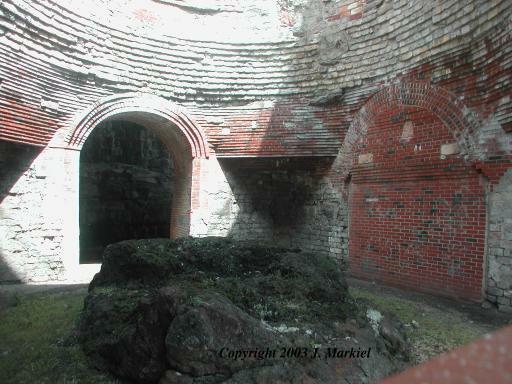 The abandoned anthracite furnace at Hopewell Furnace was one of many failed attempts. In fact, William Henry struggled for several years to perfect the method and nearly caused the bankruptcy of the firm. Eventually, Seldon Scranton enlisted the assistance of a man named John F. Davis. 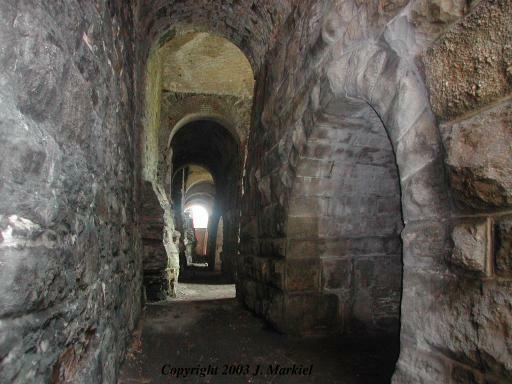 John Davis was a Welshman and was familiar with the use of anthracite coal as a furnace fuel. 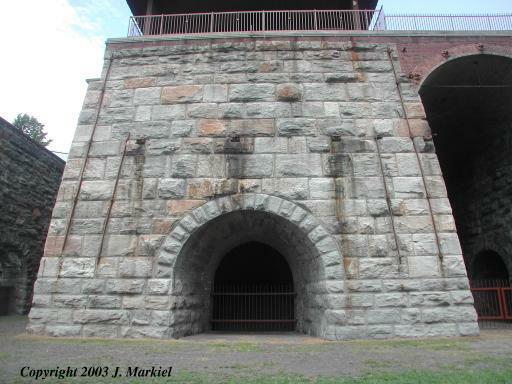 After several years of ongoing improvements, the first Scranton Furnace produced 643 tons of pig iron in 1843. After several years of struggle, the Scranton family moved from the production of raw iron to the manufacture of T-rails for the emerging railroad industry. During this time, all rails had to be imported from Britain at considerable expense. It was purely a case of being in the right place at the right time. 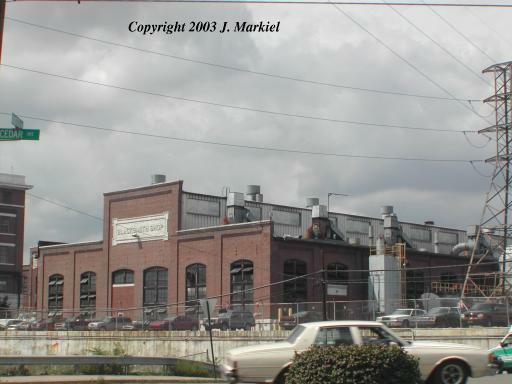 The Scranton's had access to the iron and coal necessary to manufacture the iron, and built massive rolling mills to produce the rails. At one time, it is estimated that 1 of every 6 rails produced in the United States originated from the Scranton Iron Works. 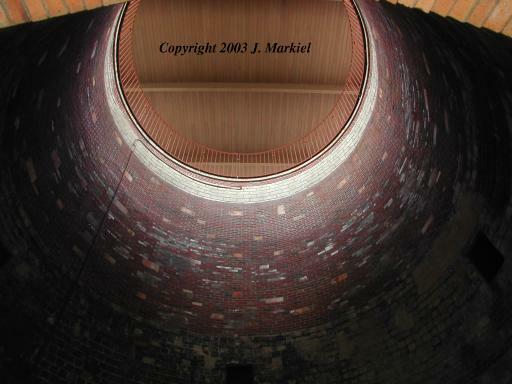 The furnaces are in excellent condition and are simply immense. 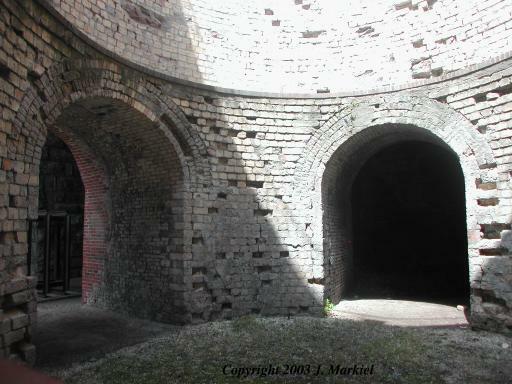 It is unfortunate that the nothing remains of the inner cupolas - perhaps the only weak point of the entire site. 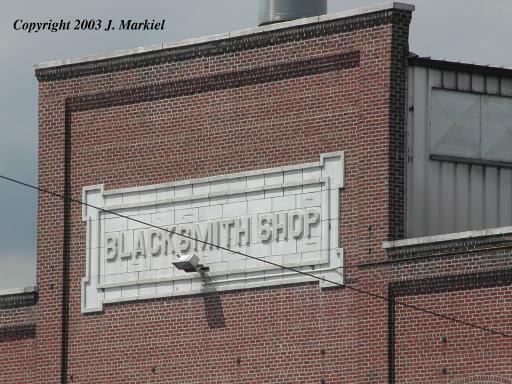 Across the road from the furnace is the original blacksmith's shop, with the adjoining rolling mill site. 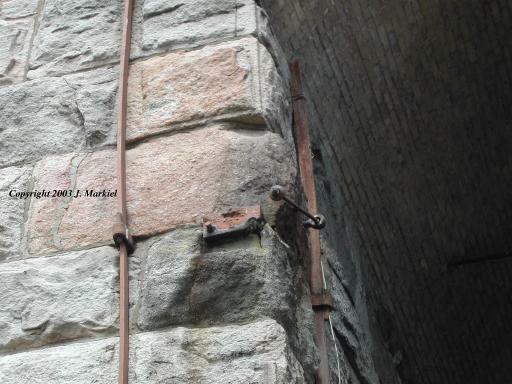 Behind the furnace, on the opposite side the railtracks is the Lackawanna Train Station, one of the most famous such buildings in the world. The overall sense of the Scranton site is one of great size - nothing was done in miniature. The museum at the furnace site has a number of old pictures, some of which can be seen at Old Scranton Pictures. Daily Tonnage: 7 tons at start, by 1900, 300,000 tons per year. 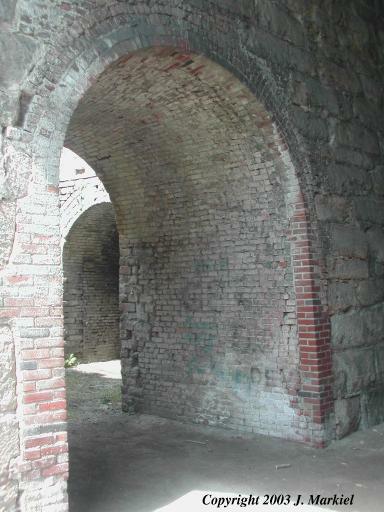 The following information was obtained from the National Register of Historic Places. 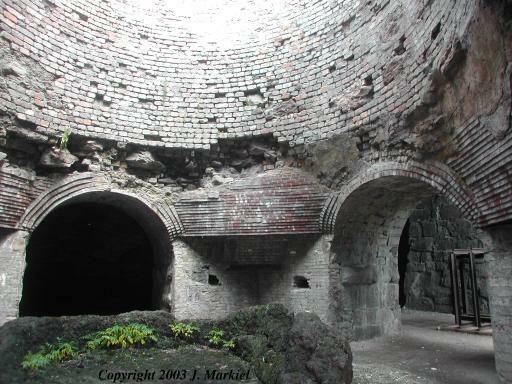 The Lackawanna Iron and Coal Company Furnaces represent the remnants of an industry with important statewide significance. As early as 1838, William Henry was investigating the feasibility of establishing an anthracite fueled blast furnace along Roaring Brook in the Lackawanna Valley. Well schooled in the process of making iron, Henry had been the first American to experiment successfully with applying a hot blast to the smelting of iron ore at the Oxford Furnace in Belvidere, New Jersey. In 1840 Henry bought 503 acres in alliance with his son-in-law Seldon Scranton, George Scranton, and Sanford Grant. 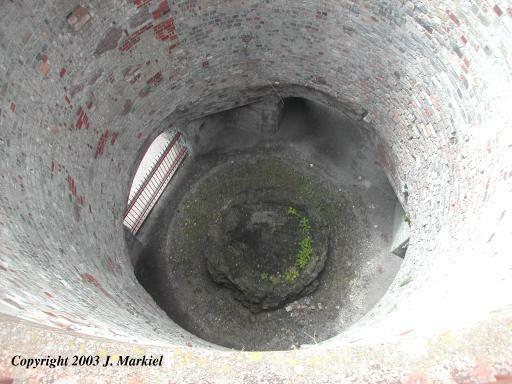 The blast furnace was not completed until early autumn of 1841. By the summer of 1844 the furnace averaged five to seven tons of pig iron a day, but the company soon went into the more profitable business of producing T-rails for the railroad industry. In 1847, the company listed 800 employees, including many Welsh, Irish, and German immigrants. In 1853 the firm reorganized again and became the Lackawanna Iron & Coal Company. The company's assets in 1854 included three furnaces, the rolling and puddling mills, foundry, two blacksmith shops, car shop, two carpenter's shops, saw mill, grist mill, office, company store, 200 dwellings, boarding house, manager's houses, ore and coal mines, tavern, and a recently completed hotel. Eventually, due to the cost of shipping iron ore into Scranton from the Midwest, as well as the changing markets, a decision was made to move the plant to Buffalo, New York. 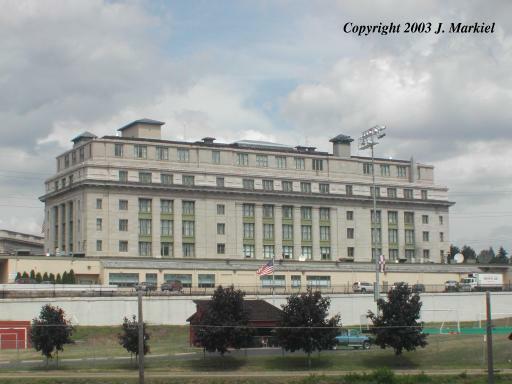 In 1903 the Scranton property was sold to the Wyoming Valley Railroad, which contracted with a Philadelphia company that scrapped all of the equipment, and tore down all the structures except the stone blast furnaces. 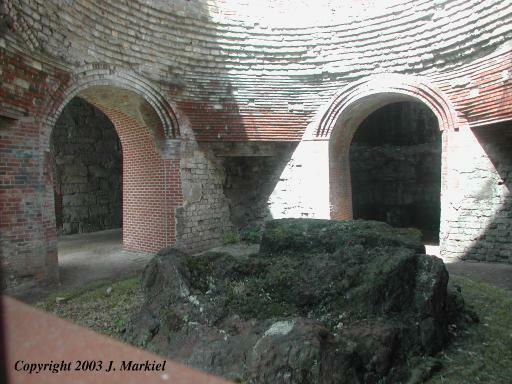 In the late 1960s the furnaces were acquired by the Commonwealth of Pennsylvania, and were administered under the State park system. 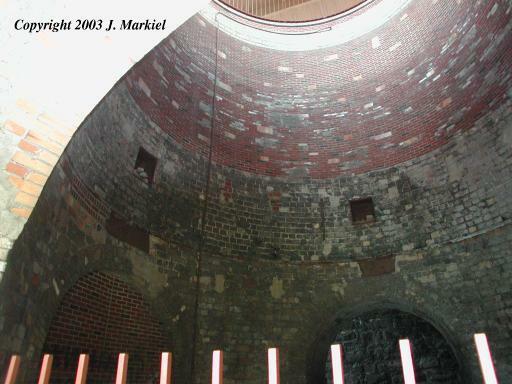 The furnaces were transferred to the Pennsylvania Historical and Museum Commission in 1971. Today the four connected stone blast furnace stacks are surrounded by 3.84 acres. 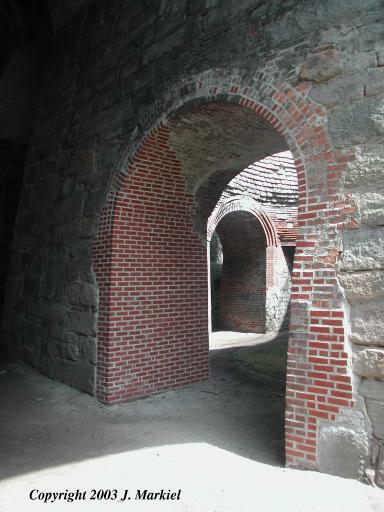 The furnaces are set into the south side of a hillside with a 10 foot wide bridge, supported by masonry arches connecting them to the rock cliff. 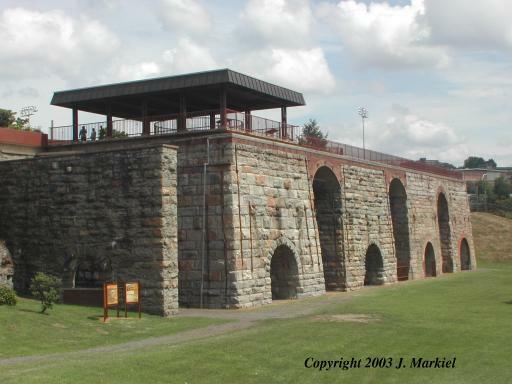 The two easternmost furnaces, dated 1848-1849, are built of smooth dressed stone blocks and stand 40 feet high and are 40 feet wide at the base. No. 3 and No. 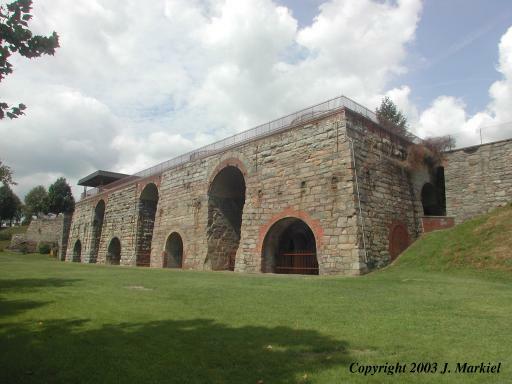 4 furnaces were constructed c.1852 and c.1857 respectively, and are constructed of rough dressed stone blocks and also stand 40 feet high. Furnace No. 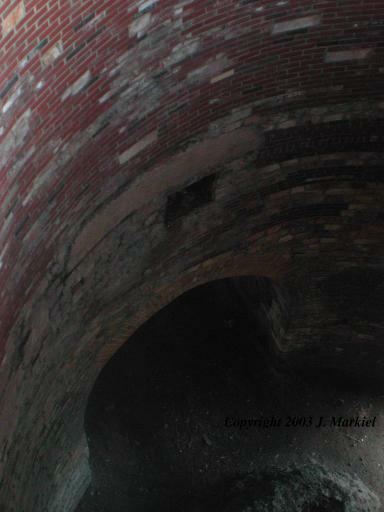 3 is 46 feet wide at the base, and furnace No. 4 is 48 feet wide at the base. 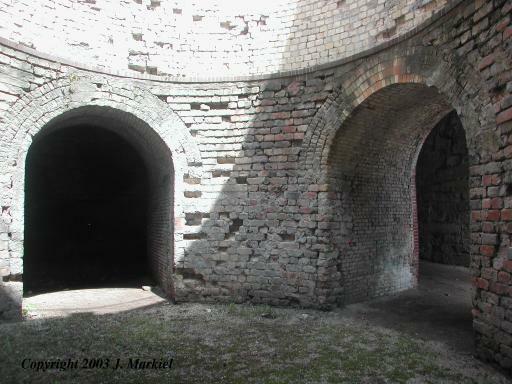 All of the furnace stacks still contain vestiges of their firebrick linings. 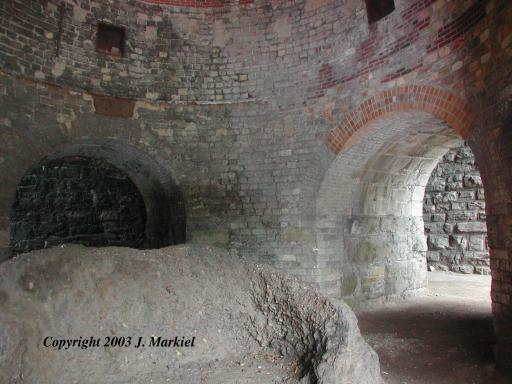 The first, third and fourth stacks contain ruins of their 19th-century hearths. A short pictorial history of the railroad in Scranton can be located at Scranton Railroad. After the iron ran out and the iron works were shut down, the Scrantons acted like robber barons, strip mining the Lackawanna Valley for the native coal. A short pictorial history of the coal mining can be located at Scranton Coal. Located in the in Scranton, Pennsylvania. 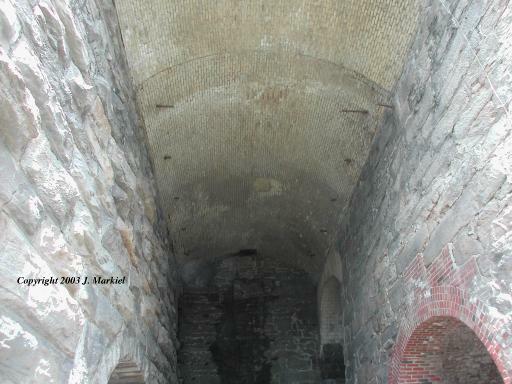 "http:// The Pennsylvania State Parks operates a website at Scranton Iron Furnace.